A daughter’s love. A monarch’s duty. On the road to greatness, one young woman must make an unthinkable choice. For Princess Mary, life has never been simple, but through it all the love of her father, the Duke of York, has been a constant and reliable comfort. Despite his own loyalty to the Catholic Church, the Duke and his brother, King Charles II, raised Mary as a Protestant to protect her in a time of religious and political upheaval. In order to cement this safety and to ensure the stability of the family line, at age fifteen, Mary is married to her Protestant first cousin William, Prince of Orange. However, in post-Restoration England, matters are rarely so simply settled. 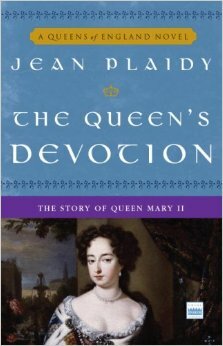 When Mary’s uncle, King Charles II, dies suddenly and without an heir, her beloved father is crowned James II. But a Catholic king is not the will of the people, and even Mary’s own husband is crying out for change. Can Mary take part in actions that will ultimately remove her own father from the throne and endanger his life? With family loyalty and the will of a nation at odds, what choice can a young princess make? With emotional clarity and vivid historical detail, beloved author Jean Plaidy brings us into the court and behind the scenes as history unfolds—and the young princess and her groom become William and Mary—the legendary monarchs, and the only co-regents in the history of a nation. This is the story of Mary II of England and her consort William of Orange. Mary isn’t the most interesting monarch; in fact she has no spirit or desire to rule. She is conflicted her entire married life (from age 15) with whether to give allegiance to her Catholic father or her Protestant husband. Her decisions haunt her throughout her rule, as she cannot appease them both. Perhaps it is why there aren’t a lot of novels on Mary, but she just is not a very admirable protagonist. She is kind and good, but has no willfulness to take charge of her life and lead a more desirable existence. While I am always impressed with Jean Plaidy’s meticulous research, political detail and understanding of character and personality, this is not a gripping page-turner. It is, however, an excellent account of the life of Mary II and her role as niece to a king, daughter of a king and queen in her own right, as well as wife to a man she made king of England.